We were all ready to go when we saw the wind getting up and the sky darkening. Then the rain came, then the lightning and thunder. Son #1 was disappointed. We thought the races would be cancelled, so we took off our tri-suits, played and pottered around waiting for any news. We had set up our bikes, helmets and packed the transition bag the night before. It would be my eldest son's first triathlon race and my first time racing since giving birth to our third baby. I was very much looking forward to it, especially the cycle leg after my bike had been for a superb, thorough service and race-tune up just a few days before. Every 15-30 minutes there were updates on the status of the race. It looked like the storm was settling in, and we knew that the organisers had a limit on how long they could keep the roads closed for the cycle part of the race, so it was unlikely to go ahead as planned. At about 10:15am it was confirmed that the race was on, with new wave times published, but without a bike leg, just swim-run. I finished feeding the baby and put him to bed. We had planned to bring him to the race with us, but the change in time meant he would be due a long nap whil we were out - better in his bed than in the trailer, plus now the clouds were clearing it was starting to get hot. I showed our babysitter the bottle of expressed milk in the 'fridge, we got dressed again, jumped on bikes and made our way to the race start. I showed son #1 how I set up my transition for swim to run, then helped him with his. We made sure we knew where the run out and finish were and went for body marking. There wasn't much time before my wave was called, just enough time to say "Hi" to Coach Ben and his family, then settle my family with the bags and food under a tree near the beach. ... and we were off! I got a good start to the swim, but my lack of fitness started to show quite quickly. By the second buouy two women had overtaken me and I was finding it tough to maintain my form. I tried hard and was third out of the water. In transition my spot was furthest away from the swim in and furthest away from the run out, so I had over 100 metres extra transition distance to cover compared to the person with the spot on the other end of the row! I was overtaken in transition by two women who were 5-15 seconds behind me out of the water. The run felt like a long slog. Carrying 10kg of extra weight around in tropical heat at midday after a hard swim was not easy! I was happy to be out racing and confident that this was the beginning of the road towards fitness, so I put my best foot forward and got on with it. At the 2km marker I overtook one woman in my wave and then just before the turn around I passed a second which put me back into third place. I knew I had been third in the swim, I had overtaken two, but I didn't realise that I had been passed by two in transition, so I thought I might have been leading!?!?!!! The kids and hubby cheered me on the home straight and then son #2 came to claim my finisher medal at the end of the race. We all waited on the beach, watching and cheering the waves of swimmers as they ran into the water. Son #2 was soaked through, collecting sticks from the shoreline but son #1 refused to get wet or have a practice swim! Soon enough, it was his turn to line up between the the start posts. He went straight to the front of the group, despite being the smallest. He sprinted off when the starting horn sounded but by the time they reached the water he was in the middle of the group. He swam well, with good form and stayed in the middle of the pack the whole way round. He was happy, running up the beach into transition and was smiling as he put on his race belt and shoes. The next time I saw him was 50 metres from the finish line, running as fast as his little legs would carry him with a big grin on his face, acknowledging the cheers from the sidelines! I'm not sure whether he or I were most proud of his performance! He was so chuffed with himself and asked if he could do another one! 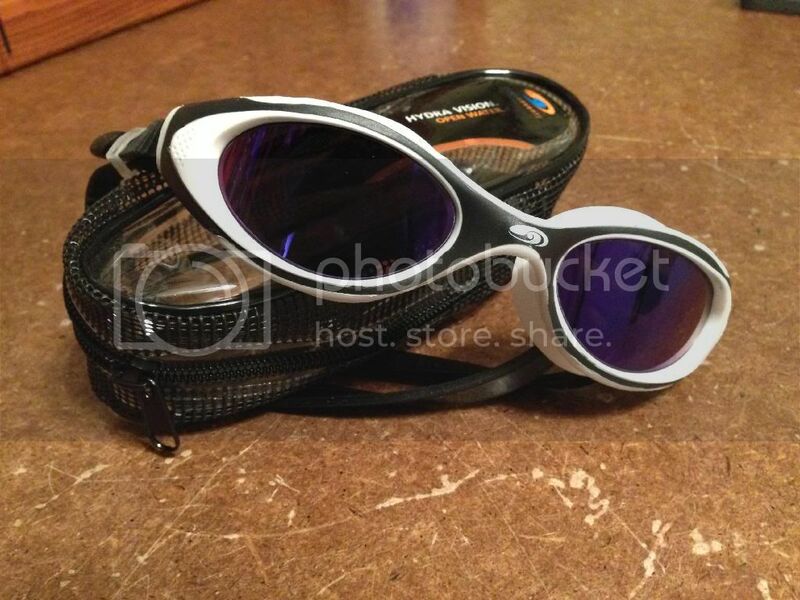 When I went to collect our goggles from the transition area, I found that mine had disappeared. I'd like to think that someone had mistakenly taken them and I might get them back... they are blueseventy hydra-vision and look like this. We'd just repacked the bags and changed clothes when the presentations started. I was very pleased to take third place in my first race back and even more pleased that my son had enjoyed his race! We cycled home at a good pace despite our tired legs to get back to the baby quickly! I have to say, the organisers managed the consequences of the inclement weather very well. They had a few tough decisions to make and indeed took the best choices possible to make the races happen whilst keeping us safe and managing the road closure restrictions. Hats off to you!